I took a workshop in December 2014, at the San Francisco Center for the Book, intriguingly called The Deconstructed-Reconstructed Book, taught by artist Judy Serebrin. Just reading the workshop description, I became so enamored of the process that I started experimenting with it even prior to the workshop! 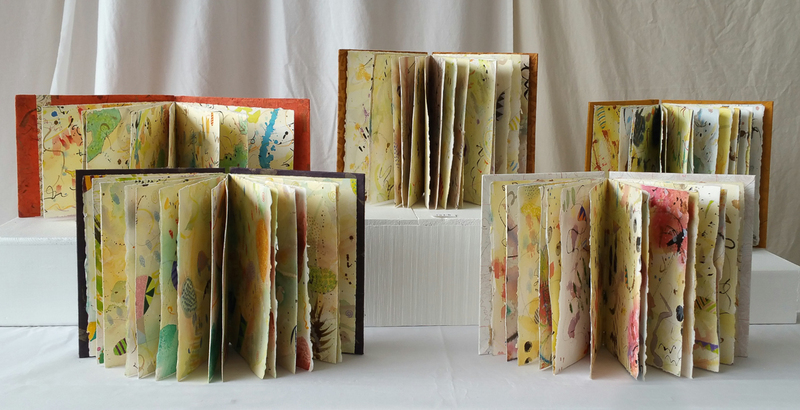 Since then I have made a number of these artist’s books, and a few months ago I decided to sign up again for East Bay Open Studios. This past weekend, June 6th and 7th, over 80 people came through my studio. What I enjoy most about Open Studio is seeing people interacting with the artwork and having conversations with them. Some people are curious about the artistic process and others share what they see in the books or how they feel about them. A few children and teens who came expressed their unique and interesting perspectives. All this gave me a lot to contemplate about the meaning and function of art. A number of friends came, too, who were enthusiastic and supportive! Thanks to everyone who stopped by, whether in person or in spirit! And thanks to ProArts (proartsgallery.org) for all its great work organizing and publicizing East Bay Open Studios this year and every year! This entry was posted in Art, Book Arts, Creativity, Imagination, Play and tagged art, Berkeley, book arts, creativity, East Bay Open Studios, imagination, play, San Francisco Bay Area on June 8, 2015 by René Thomas.